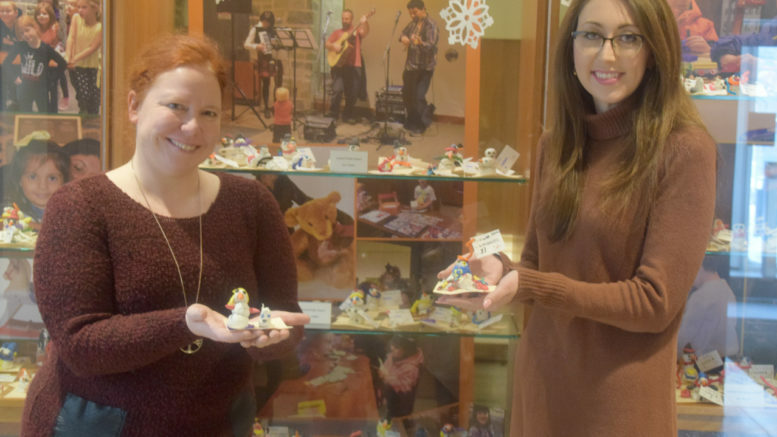 L&A County Museum and Archive's Joanne Himmelman and Amber Meyer show off snowpeople made from clay by local students. Photo by Adam Prudhomme. Redefining the image of a museum being a stuffy place to look at old artifacts, Lennox and Addington’s County of Museum and Archives is shaking things up with its latest Museum @ Play exhibit. Its first instalment, titled Snow Expressions, features hand sculpted snowpeople by local Grade 1 through 3 students. They are miniature versions of the students themselves, reflecting their hair and eye colour while demonstrating some of their hobbies, favourite activities and pets. The snowpeople were created during class trips to the museum throughout the months of November and December and included Cornerstone Christian Academy, Fairfield Elementary School, Amherst Island Public School, Central Public School, Bath Public School, St. Patrick Catholic School, Selby Public School and Southview Public School. The concept of the program was borrowed from historian Bob Eckstein, author of The History of the Snowman, who posited that the snowman was one of mankind’s oldest forms of folk art. History even documents famous artists such as Michelangelo were known to make snowmen, much different that the three stacked snowballs that they’ve evolved into today. Meyer says the look of snowmen changed drastically following the release of Gene Autry’s Frosty the Snowman. And while no snow was used during the Snow Expressions project, the clay still captured that tradition. As part of the program the students also learned about Canadian life in the snow and the original traditions of snow bringing people together during long winter months. The students’ work will remain on display in the museum throughout the month of February. The next phase of the Museum @ Play series will be titled Lego Love and invites people to donate their lego creations to a museum display which will run from March 5 to 29. It will include a visit from local lego collector Hubert Hogle during the March Break and he’ll talk about his many Lego and Meccano builds. Anyone interested in showcasing their creations in the display can call 613-354-3027 for more details. Phase three will be Ships Ahoy and feature the Metro Marine Modellers with a display of handcrafted model ships varying from large scale to ships in a bottle. That will run April 8-Sept. 6. The final exhibit of the year will by Crazy for Nutcrackers, where residents will be invited to showcase their collection of nutcrackers within the museum display cases. It will run through the month of December. The L&A County Museum and Archives is located at 97 Thomas Street E in Napanee.